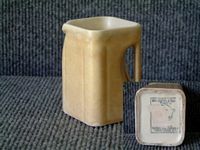 DESCRIPTION -- An as used on board china milk jug from the Cunard Line. 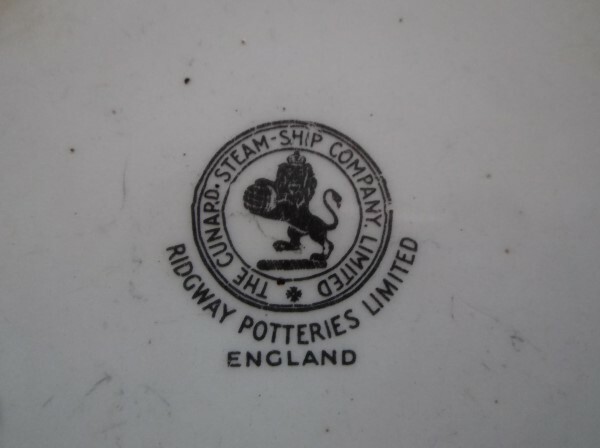 Made in the traditional square design and cream colour and is bottom marked 'Cunard Steamship Company Ltd'. 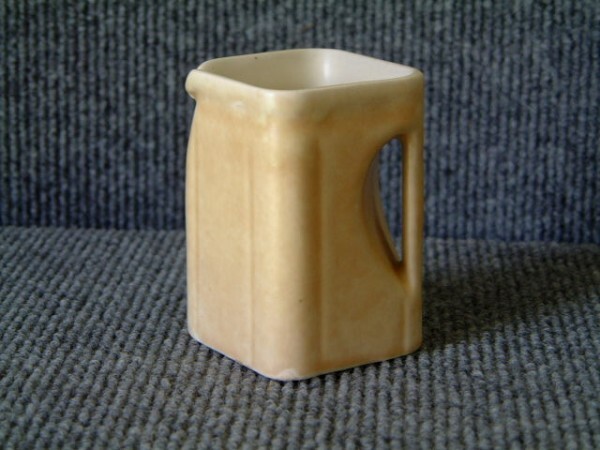 The size is 3" (8cm) high and it is 2" (5cm) square and looks in great condition. HISTORY -- One of the most well-known shipping companies, Cunard Line is a British-American cruise line based at Carnival House in Southampton, England, operated by Carnival UK and owned by Carnival Corporation & plc since 2005. It has been a leading operator of passenger ships on the North Atlantic, celebrating 175 years of operation in 2015. DESCRIPTION -- This item is 5" (13cm) wide and is a beautifully decorated blue floral china dish from the Japanese shipping company the Mitsui OSK Line. It is circa 1960's and in a fantastic nearly new condition and the type of item purchased and used on board the vessel. HISTORY -- MOL (Mitsui O.S.K. Lines, Ltd.) (Kabushiki-gaisha ShÃƒÆ’Ã‚Â´sen Mitsui) is a Japanese transport company headquartered in Toranomon, Minato, Tokyo, Japan. The company's main area of operations is international shipping. Its alligator logo can be seen on containers in ports around the world. Founded as a key part of the Mitsui zaibatsu (family-owned conglomerate) during the early industrialization of Japan, the company is now independent of the zaibatsu, but remains part of the Mitsui keiretsu (group of aligned companies). DESCRIPTION -- Rare to find early large sized original china ashtray from the Belgium Maritime Shipping Company (Compagnie Maritime Belge) which is in a great condition and a great souvenir from the company. HISTORY -- CMB, Compagnie Maritime Belge, is a maritime group with its registered offices in Antwerp. The company was founded in 1895. DESCRIPTION -- This is pair of items from a collection entitled 'Fair Winds' and are original copper engravings. They are depicting Historical Scenes of Chinese Export to America. They were made by 'Alfred Meakin' in Staffordshire, England several years ago. The china pieces show different views and are a large plate and a cup & saucer. HISTORY -- Alfred was the brother of James and George Meakin (See J & G Meakin) and founded the pottery in 1874. He ran a very successful business mass producing tableware for both the domestic market, and the growing export market of the 40's and 50's. In 1976 the pottery merged with Myott, Son and Co, who were later bought by the Churchill Group in 1991. DESCRIPTION -- From the Cunard Steamship Company an early dining side plate and is produced in the original old traditional company design pattern. It is a China piece and is bottom marked Cunard Steamship Company with the size being 6" (17.5cm) wide and is in a very good condition (click on the picture to see the bottom marked logo). HISTORY -- The Cunard Line is an American owned shipping company based at Santa Clarita, California with offices at Carnival House in Southampton, England, and owned by the dual listed company Carnival Corporation, PLC, headquartered in Miami, Florida. It has been a leading operator of passenger ships on the North Atlantic, celebrating 175 years of operation in 2015. In 1839, Nova Scotian Samuel Cunard was awarded the first British trans-Atlantic steamship mail contract, and the next year formed the British and North American Royal Mail Steam-Packet Company to operate the line's four pioneer paddle steamers on the Liverpool'Halifax'Boston route. DESCRIPTION -- Side plate from the Canadian Pacific Steamship Company and is produced in the traditional company design pattern. 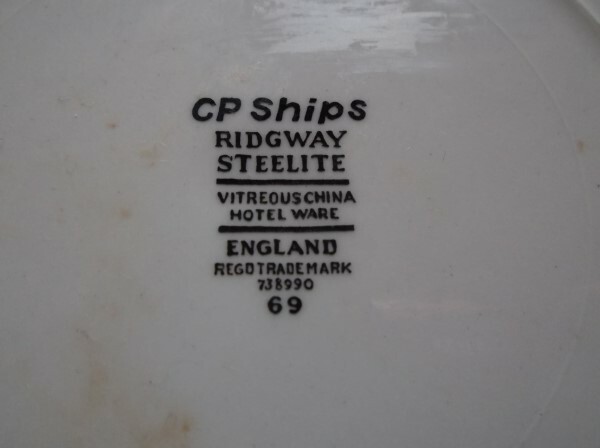 It is a China piece and is bottom marked CP Ships with the size being 6" (16cm) wide and is in a very good condition (click on picture to see a view of the base of the plate). HISTORY -- In the early 1880s, the Canadian Pacific Railway (CPR) negotiated with the Government of the United Kingdom to establish a trans-Pacific steamship routes between Vancouver and the Far East. In 1891, the Canadian Pacific Railway adopted a new name the Canadian Pacific Steamship Company (CPSC). The CPSC became one of the many shipping companies operating in and out of Liverpool. The company expanded as people emigrating from Europe to North America provided a larger number of passengers and the company also started holiday cruises. As with other shipping companies, CPSC had larger ships built to cope with the demand. DESCRIPTION -- Fantastic item from the United Baltic Corporation Company and is china cup and saucer set. It is made in the company design and colour and shows on the saucer the company houseflag and name. The items are in an excellent condition and date from the 1960's (click on the picture to see a close up view of the houseflag and crest). HISTORY -- The United Baltic Corporation was formed as a partnership with Andrew Weir & Co. in 1919. The early 1920s saw services extend from Copenhagen to South Africa, Cuba, Australia, Mexico and North Pacific ports. New York and, later, Philadelphia, Baltimore or Norfolk, Virginia were among the ports of call added for ships on the north Pacific route in 1940. Connections between Vancouver and the far east were handled by Johnson Walton Steamships Ltd of Vancouver, when they were acquired in 1949. Most recently, cargo was the mainstay of the business. 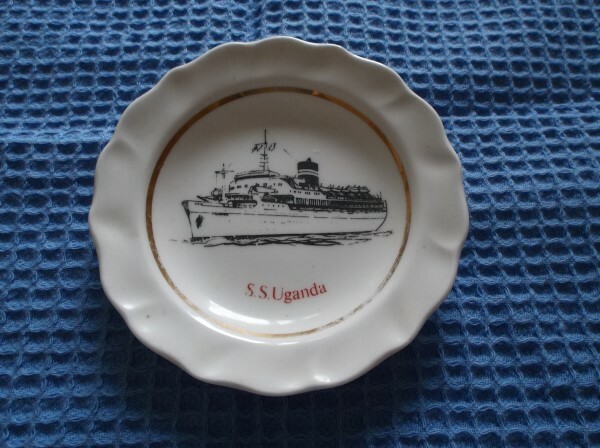 SUPERB DECORATIVE CHINA DISH SOUVENIR FROM THE SS UGANDA OF THE B.I.S.N.Co. DESCRIPTION -- From the vessel the SS Uganda this is a circular china dish which is in a fantastic condition and the item shows in the centre a picture of the ship and the vessel's name. This great item from the British India Steamship Navigational Company has a size of 4" (12cm) wide and the type of item purchased and used on board the vessel. HISTORY -- The British India Steam Navigation Company ("BI") was formed in 1856 as the Calcutta and Burmah Steam Navigation Company. The company had been formed out of Mackinnon, Mackenzie & Co, a trading partnership of the Scots William Mackinnon and Robert Mackenzie, to carry mail between Calcutta and Rangoon. It became British India SN Co in 1862. Under the hand of Lord Inchcape (James Lyle Mackay) who had become chairman in 1913, the company became part of the P&O group of companies in 1914 through a complex amalgamation, but continued with its own identity and organisation for another nearly 60 years until 1972, when it was entirely absorbed into P&O. 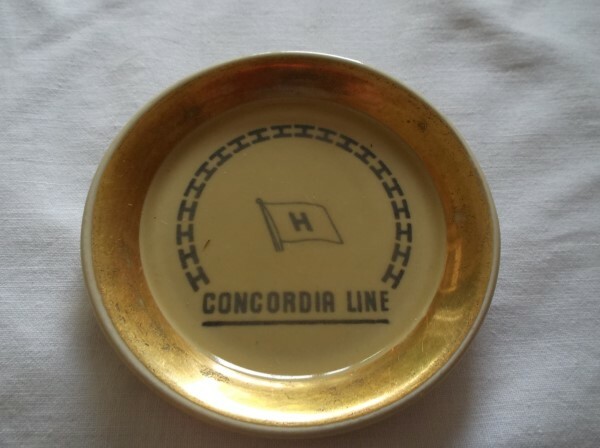 DESCRIPTION -- Small round china pin dish from the Concordia shipping Line and an early item which is in an excellent condition and shows on it the company name and houseflag in centre with the size being 3" (9cm) wide. DESCRIPTION -- Excellent condition side plate from the Furness Bermuda Line shipping company which is an original from the company and the size is 5Â½â€ (14cm). HISTORY -- In 1919 Furness Bermuda Line was awarded the mail contract for the New York to Bermuda service. This service reached its zenith in the years just before the Second World War when Furness Bermuda Line ordered two magnificent luxury liners ' the Monarch of Bermuda and the Queen of Bermuda. The Furness-Burmuda Line operated a fleet of steamships that operated primarily between New York and the Bermuda Islands.